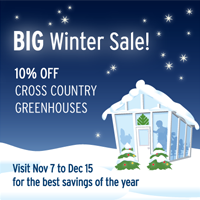 BIG Winter Greenhouse Sale Extended Until January 31, 2012! Hurry this offer expires January 31, 2012! Our Greenhouse Salehas been extended until January 31, 2012! Our biggest greenhouse sale of the year! Backyard Greenhouses is pleased to offer a 10% discount on hobby greenhouse kits and lean-to home attached models purchased before January 31, 2012. Delivery of the greenhouse must be made prior to February 29, 2012. Backyard Greenhouses cannot delay fabricating the greenhouse for shipping purposes and greenhouses will not be stored. To receive your free greenhouse quote and greenhouse discount, please call greenhouse consultant, Shelley Awad, at 1-800-665-2124.